Pirozhki or piroshki or Piroski (as we call them in Greece, with stress on the last syllable), are made from yeast dough and filled with a variety of fillings and are great for snacks, appetizers, lunch or dinner. Last week when I visited my friend Natasha who had made Pirozhki filled with eggs and green onions and immediately I knew I wanted to make some. I know they make them in several parts of the world but don’t confuse them with pierogi. These are different. Do you make them and what filling do you like best? I have posted Piroskis back in 2008 making them with three different fillings but using eggs never passed my mind. Although I love eggs in general, actually I am not a fan of hard boiled dyed Easter eggs but it’s tradition to have them dyed during Easter and we have lots of fun cracking them. My husband, on the other hand, loves them either for breakfast or cut with salt, pepper and olive oil as a mezes but this year due to his gallbladder diet, he is not allowed to eat any eggs at all. Although I did not dye a lot, the children ate a few and I only ate one, so until yesterday I had some eggs lying in the fridge and it was time to do something about them. My dough recipe is not very different from Natasha’s but instead of using butter (both in the dough and for frying the onions), we’ve had our share of butter during Easter, so I preferred to use olive oil. I decided to make two fillings as it would not be fair for my husband to watch us eating the one with eggs. For the second one, I combined boiled potatoes and leeks and in both I added some of my Pesto with Kafkalithres and Myronia, which added amazing taste to both. I had some leftover pesto in the deep freezer, so I used it frozen. You can skip the pesto or add any kind you like best. 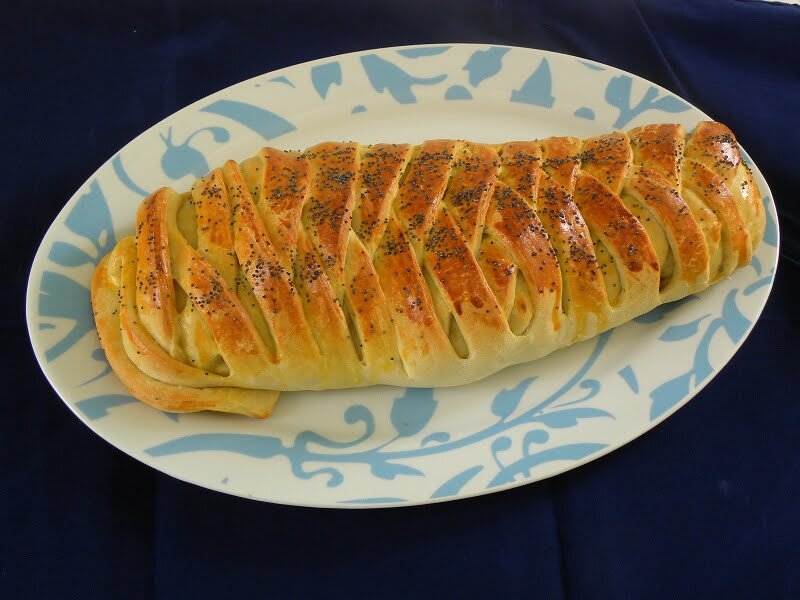 In Greece, we usually pan fry piroskis but these are also not allowed for his diet, so after making Savory Braided Tsourekia, I decided to use this method to make the piroshkis and bake them in oven. I find this method much easier rather than making individual ones and of course lighter and much healthier. After glazing them I sprinkled some poppy seeds on one of them and on the others I sprinkled some of my spice mixture which also added a wonderful taste to the dough. As I said above both were delicious but when I make them again, if we do not have any dietary problems to face, I shall combine both fillings into one: potatoes, eggs, green onions, leek, herbs etc. This filling is so delicious that it can be easily made into a potato and egg salad. I think it would be a great filling. *I reserved the yolk to glaze the piroski on top and as I already have enough in the deep freezer, in order not to waste it, I added the egg white in the dough, so depending on the size of your eggs, the milk may not all be necessary. In a big bowl add yeast, flour, sugar and part of the milk. Cover with cling film and a napkin and set aside until it rises. In the bowl of your mixer attach the dough hook and add remaining flour, olive oil, salt and mix. Add the yeast and mix, then add egg and egg white*, mix and finally add milk gradually and knead until the dough gathers around the hook and does not stick on your hands. Cover with cling film and a napkin and leave it to rise until it doubles in volume. When it is ready, flour your working surface and knead the dough for a few seconds and then make a roll which divide into three pieces. Work with one piece and cover the remaining with cling film. Meanwhile, heat olive oil in a non-stick frying pan and sauté green onions, for a few minutes until soft. Finely cut the hard-boiled eggs and combine with green onions, adding pesto and mixing until the pesto melts. Season with salt and pepper and mix in dill. Set aside until it cools. Peel potatoes, cut them in small pieces and boil until soft. (You can prepare the potatoes from the previous day). Drain and set aside. In a non-stick frying pan heat the olive oil and sauté the leeks for a few minutes. Add the garlic and sauté until translucent. Add the potatoes together with the frozen pesto and using a fork, mash the potatoes and mix the pesto until it melts. Season with salt and pepper and mix in the parsley. Remove from the heat and set aside to cool. Then mix in the yoghurt. Roll out the dough and brush it with olive oil. See how to make them here. Add the filling in the middle and form the braid. Line a large baking sheet with parchment paper and place each braided bread. Mix the egg yolk with 1 tablespoon of milk. Brush the pirozhki with the egg mixture and sprinkle some poppy seeds or spice mixture on top. Set aside to rise. Bake for 20 – 25 minutes or until golden. Une très belle tresse. Je fais la même chose et pour aller plus vite,j’utilise une pâte feuilletée. L’avantage est qu’on peut mettre ce qu’on veut comme farce. Ta version doit être délicieuse. Je note. Creative recipe! Very nicely executed! Wow Ivy…this is def a great way to use up those leftover Easter eggs. The piroskis look fantastic! I had no idea at first about the egg filling. Sounds very interesting and I want to try it out myself very soon. This recipe looks a little difficult especially the art work look. But I’m gonna still try and see how it works for me. Ivy, i love your blog, and I hope- I’ll prepare your sweet Tsoureki once. Same pies I made with beetroot leafs an feta filling with addition of Samardala spice ( Bulgarian salty dry herb)- it’s fantastic taste. Thank you Elena. Have never tried samardala spice. Shall google search and find more about it.